Mark Wahlberg, Christian Bale and Amy Adams star in the new film from director David O.Russell (""Three Kings") about the rise of boxer "Irish" Mickey Ward. Boxing fans who went to see "The Fighter" were no doubt entertained, but also most likely puzzled by the end of the movie, wondering how on Earth you could tell the story of "Irish" Mickey Ward and not include his three fights with Arturo Gatti. Now we know. Two years after the title bout against Shea Neary (which we see at the end of "The Fighter"), Ward fought Gatti in three epically brutal bouts that resulted in multiple hospitalizations for both fighters. They were also the final fights of Ward's career. PopcornBiz attended "The Fighter" with Earl Morton, the man who referreed the last two Gatti/Ward fights. Morton was impressed with Wahlberg's portrayal of Ward, and you can be sure we'll be reaching out to him when the sequel comes out. 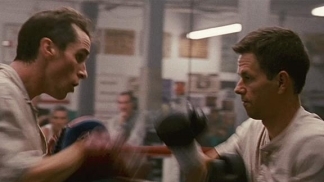 Considering the success "The Fighter" enjoyed--$90 million at the box office, 2 Oscars (for stars Melissa Leo and Christian Bale) and 5 other nominations--the sequel will probably come together much more quickly than the original, which took Wahlberg years to make happen. For a taste of just how bloody these three fights were, check out this clip, that was found by The Playlist.